Joel Grey is not exactly a Hollywood movie star from the classic period, but he IS among the less than a dozen performers in history to win both a Tony and an Oscar for portraying the same part on stage and in film. Much like Yul Brynner, Grey will be eternally identified for just one role: that of the Master of Ceremonies in the musical, Cabaret. For his performance in the 1966 musical, Grey walked off with a Tony in the “best featured actor in a musical” category. The 1972 movie version of Cabaret made a huge splash, and walked off with boatload of Oscars — including Grey’s (best supporting actor), Liza Minnelli’s (best actress) and Bob Fosse’s (best director). It lost out as best picture to The Godfather. Otherwise, Grey’s movie career is desultory at best. Of his nearly 70 career film and tv credits, perhaps just a dozen are big screen features. And his parts are all over the lot: including those as a producer in Robert Altman’s 1976 title, Buffalo Bill; a 1976 film version of the long-running off-Broadway classic, The Fantasticks; 1985’s Remo Williams: The Adventure Begins; and even a turn as Joseph Goebbels in 2010’s A. Hitler. Not widely known is that Grey also played the title role of George M. Cohan in the 1968 Broadway musical George M!, and played the same role in 1970 tv version. Alas, no wins. Grey was Tony nominated for the former, but came up empty for the latter. These days, Grey, who is 86 (pictured below as he is today) spends much of his time as a photographer, and has several books and exhibitions to his credit. From 1958 until 1982, he was married to Jo Wilder. The couple has two children including actress Jennifer Grey, costar of Dirty Dancing. In a 2016 memoir — Master of Ceremonies (ah, that Cabaret reference again) — Grey discusses his sexuality: If you have to put a label on me, I’m a gay man. 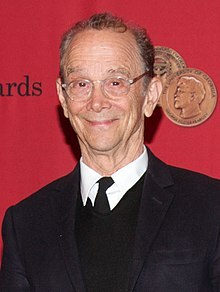 JOEL GREY is GAY… Who would’ve guessed that? Notice he waited till he was 82 to announce that revelation to the world… A trending now, socially engineered PC world where a celebrities sexuality, meaning if they’re gay, is now heralded and made so much more important, than someone who is not. Its all become Alice In Wonderland, style over substance, a total distraction and diversion from what really matters. And Joel Grey winning both a Tony Award and an Oscar for his great performance in the same part on both stage and film… Well, that’s all we need to know!